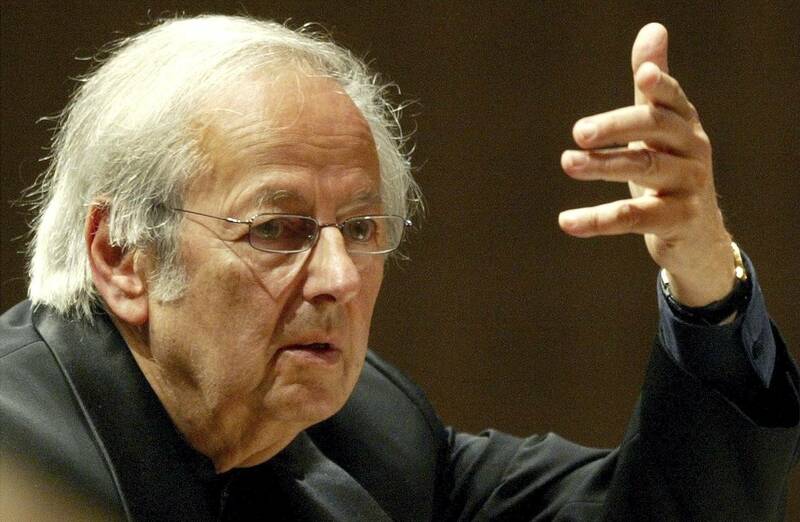 Former LA Phil Music Director André Previn, at one time a fixture on the Los Angeles music scene, has died in New York City. He may have been born in Berlin, which his family fled during the Nazi era, but Previn became closely associated with Los Angeles in his early professional life as a film composer and jazz pianist, much later as Music Director of the LA Philharmonic. Two obituaries, one from the LA Phil and the other the London Symphony Orchestra, cover his significant musical contributions on two continents. Decades ago, as Deputy Director of the L.A. City Cultural Affairs Department, I presented a City of Los Angeles proclamation to Previn as part of a celebration of his birthday by the USC Friends of Music. The schedule had me giving the proclamation first. When that was done, the maestro bounded to the podium and gave what amounted to an acceptance speech, full of lively musical anecdotes, and spiced with self-deprecating humor. Unfortunately, Previn had not been informed that the Dean of the USC School of Music had prepared a long recitation of his life accomplishments, obviously to be delivered before that acceptance speech. After an awkward moment, the Dean went into his elevated praise. Though well delivered, it proved anti-climactic after Previn's light-hearted banter. No matter. Everyone appreciated the good intentions and Previn's amusing remarks. Addendum: Our colleague David Mermelstein's excellent obituary of André Previn in the Wall Street Journal has just been received and is now included below in full. André Previn, among the 20th century’s most redoubtable musicians and certainly one of its most versatile, missed two enviable milestones in dying today. In April, he would have turned 90, and in October the Los Angeles Philharmonic was scheduled to present a new work it had commissioned from him, intended as a highlight of its centennial celebrations. 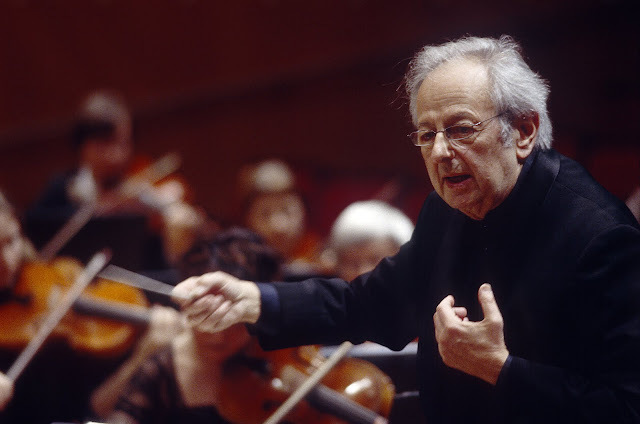 No less important, that premiere would have served as something of a public apology for the Philharmonic’s unceremonious treatment of Mr. Previn in the late 1980s, when he was the orchestra’s ninth music director. His tenure, from 1985 to 1989, was unexpectedly brief, thanks to a power struggle that resulted in his resignation and the elevation of Esa-Pekka Salonen to the job. It rivals in embarrassment an incident in the early 1960s when Georg Solti hastily departed the Philharmonic as music director designate after a conflict with the orchestra’s lead patron. Mr. Previn could be a dutiful, rather than inspired, conductor, and his slouchy, matter-of-fact podium manner was far from dazzling. But when sufficiently motivated—especially by British composers like Elgar, Vaughan Williams and William Walton; French Impressionists like Debussy and Ravel; Russian Romantics like Tchaikovsky and Rachmaninoff; and midcentury American modernists like Harold Shapero—he could enthrall audiences with his grasp of structure, flair for tonal coloring, and fierce commitment. 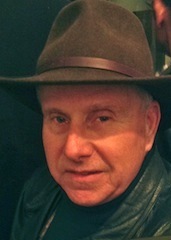 His assumption of the music directorship in Los Angeles seemed both unlikely and predestined. The Berlin-born Previn, the son of a lawyer and later judge, fled the Nazis with his family and relocated to Los Angeles, where Charles Previn, a second cousin once removed, was a film composer and arranger at Universal. A career in film music for the musically (and otherwise) gifted André seemed logical and convenient, and he became something of a wunderkind in Hollywood. By 1951 he had reaped his first Oscar nomination—12 more would follow, with consecutive wins for scoring in 1959 and 1960 (“Gigi” and “Porgy and Bess”) and in 1964 and 1965 (“Irma La Douce” and “My Fair Lady”). His last nomination came in 1974, for the adaptation of “Jesus Christ Superstar,” but by then he had largely left Hollywood behind. No Tinseltown hack, Mr. Previn had studied music with luminaries like Ernst Toch and Mario Castelnuovo-Tedesco (also refugees from European fascism), and while serving in the Army in 1950 he took private lessons from the great conductor Pierre Monteux, then music director of the San Francisco Symphony. Parallel to his studies and advances in classical music, Mr. Previn began distinguishing himself in jazz, mostly as a deft pianist and arranger who attracted the company of several of the era’s best-known sidemen, including the drummer Shelly Manne and the bassists Red Mitchell and Ray Brown. But the power of a full symphony orchestra, and his desire to compose for it—and later for the opera house—drew him increasingly toward classical music. His official debut came in St. Louis in 1962, and by 1967 he was chief conductor of the Houston Symphony Orchestra. 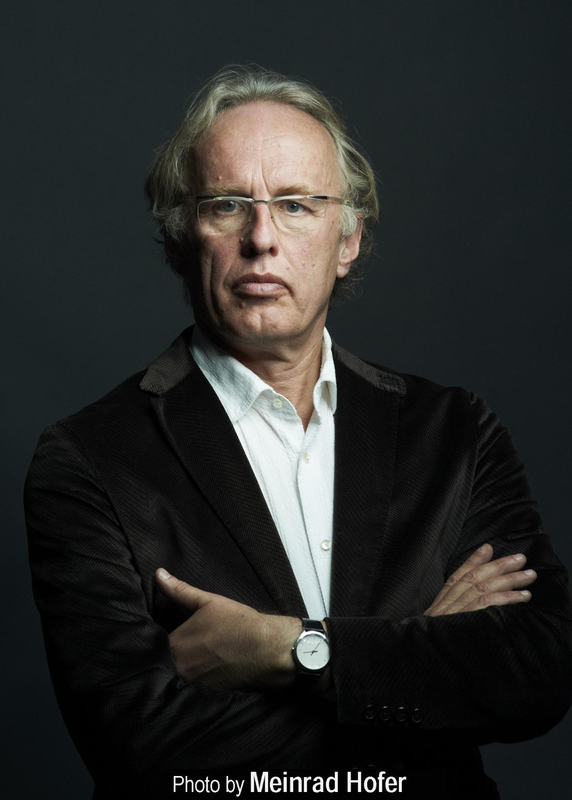 His leap to the big time came with his surprise appointment as principal conductor of the London Symphony Orchestra, where his 11-year tenure (1968 to 1979) remains the longest in that ensemble’s storied history and arguably its artistic pinnacle. He returned to the U.S. in 1976 as music director of the Pittsburgh Symphony, bringing it renewed renown and respect through 1985 (perhaps most especially in a sustained musical partnership with the violinist Itzhak Perlman). He then succeeded the revered and austere Carlo Mario Giulini as music director in Los Angeles. Mr. Previn’s love life—he was married five times—was much discussed in the gossip pages, but he understandably preferred avoiding comment and was known to respond to journalists with stony silence when the topic was raised; some found their interviews concluded on the spot. His marriage to Mia Farrow, in her pre-Woody Allen days, only complicated matters as the years progressed. But some evidence of his romantic affections could be found in his music. His final marriage, to the celebrated violinist Anne-Sophie Mutter, lasted only four years (2002 to 2006), but thanks to their amicable split bore impressive musical fruit virtually to the end of his life. His Violin Concerto, from 2001 and titled “Anne-Sophie,” essentially a valentine to Ms. Mutter, remains among his finest works and should, with its Korngold-like lyricism, endure beyond them both. Perhaps because of his protean abilities, Mr. Previn was viewed with some suspicion in various musical circles. The work, though, speaks for itself, and music lovers of many stripes will continue to be impressed well into the future by his skills—while listening to his best jazz records, performing his intelligently crafted scores, or enjoying his many outstanding performances of the classical repertory, especially the symphonies of Vaughan Williams, assorted Rachmaninoff works, and the best-known compositions of Gershwin. In this regard, Mr. Previn did live to see a rare honor: Last November, Sony Classical released all of his RCA and Columbia recordings in a 54-CD box titled “Classic Previn.” The set should quell any doubts about Mr. Previn’s importance in the musical life of the 20th century. —Mr. 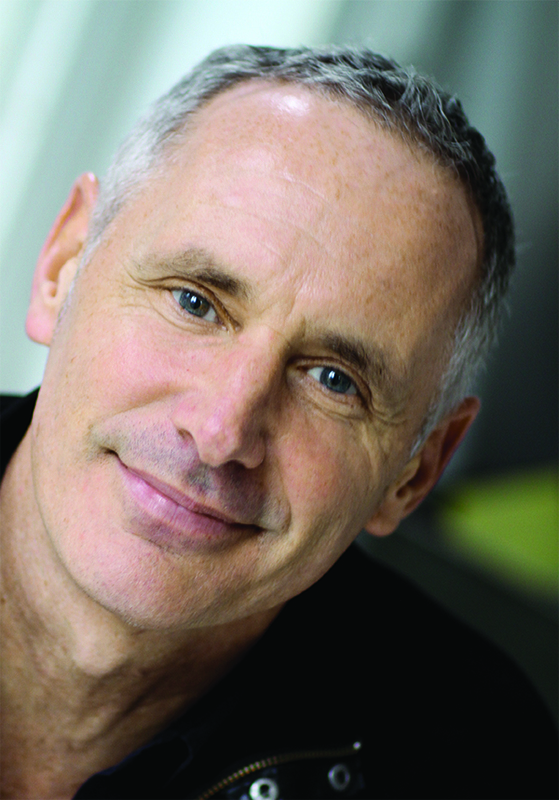 Mermelstein writes for the Wall Street Journal on classical music and film. 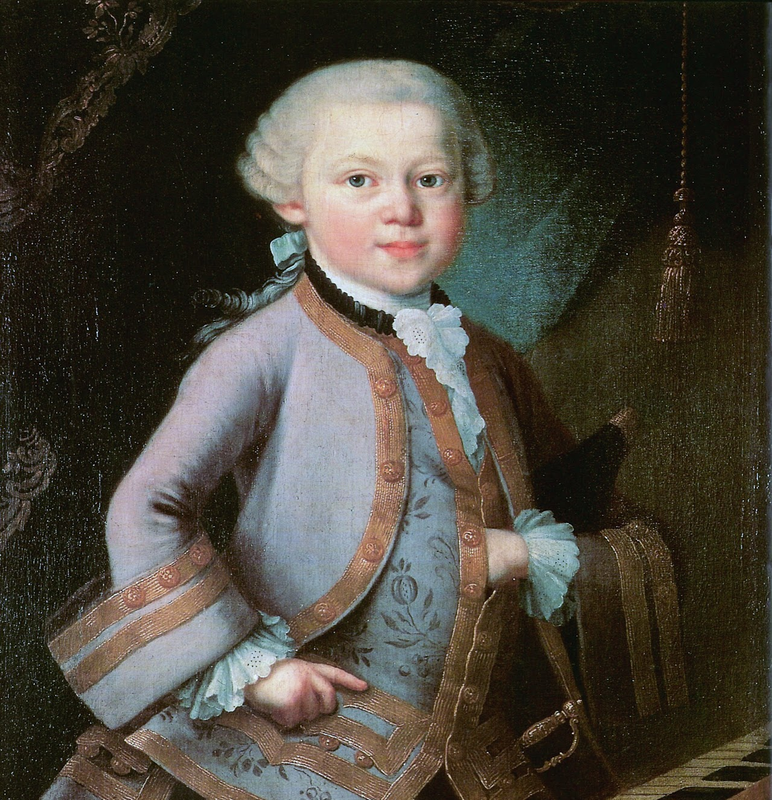 Mozart at the age of seven, artist unknown. The musical world has seen few geniuses on the level of Wolfgang Amadeus Mozart. In his short 35-year lifespan he wrote more than 600 works: operas, symphonies, sacred music, and chamber pieces, some of them the most profound, transcendent, and magical ever written. 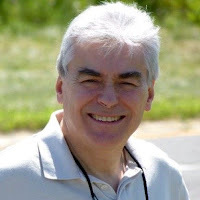 Musica Angelica, the Long Beach-based early music ensemble, presented a nice program of works from the composer’s early years on the second Saturday in February at the Beverly O’Neill Theater. The work is a cut above the usual early Classical-era symphony. Its three movements are exceedingly well crafted, with more than a spark of originality in the misterioso opening and many signs of an individual mind at work. Musica Angelica’s music director, Martin Haselböck, in his introductory remarks made much of a horn phrase that duplicates the famous opening of the finale to Mozart’s final symphony, the “Jupiter.” Interesting, but I doubt whether that is noteworthy; those four notes show up elsewhere in Mozart’s oeuvre and that of other composers with no suggestion of premonition. Musica Angelica’s personnel change from concert to concert. 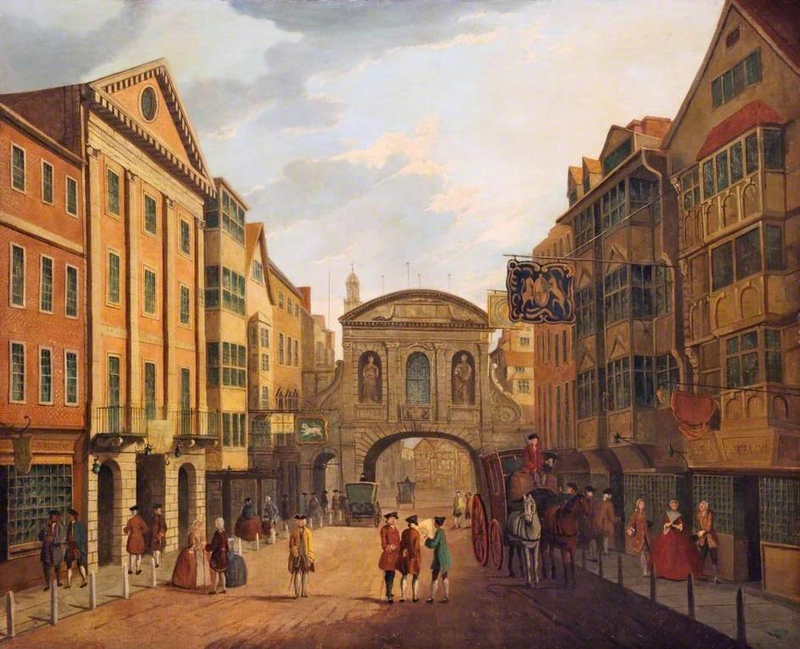 For this one, Haselböck assembled an appropriately small group—seven violins, and pairs each of violas, cellos, oboes, and horns, with a single string bass and bassoon. The size of ensemble, and the use of period instruments—including natural horns and Baroque oboes—made for a delicious sound, perfect for this music. Tempi were brisk, and the players—all of them early music specialists and some (concertmaster Ilia Korol, cellist Alexa Haynes-Pilon, and principal horn Todd Williams) virtuosos—phrased with a crisp delicacy that lightened textures and created clean, transparent counterpoint. Three of the works on this program were from the period 1774-75, by which time Mozart was a wily veteran of 18 or so. Among his prodigious output during this remarkable period, when he had returned to Salzburg somewhat abashed after unsuccessful trips to Paris and Germany in search of a job, are the five violin concertos, of which Nos. 3-5 are relatively well known and often performed. 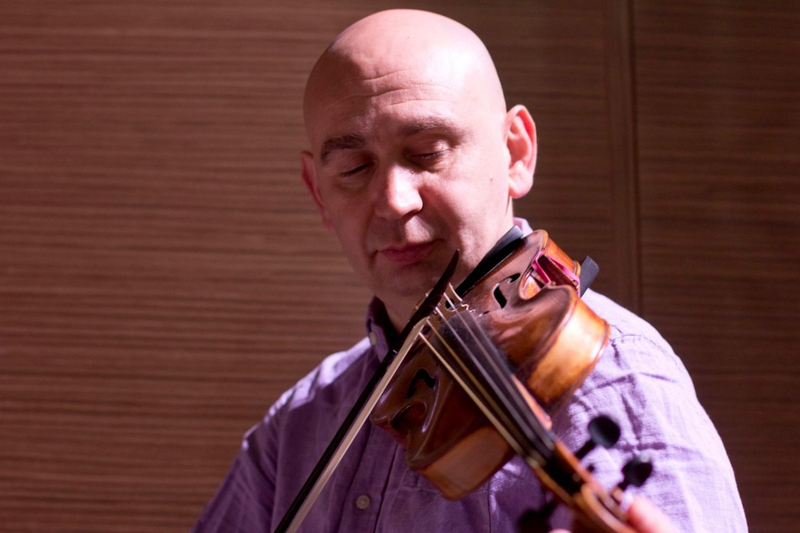 Concertmaster Korol, whose expressive face and body language are enjoyable features of his performances, instead played Violin Concerto No. 2 in D major, K. 211. I don’t know why it isn’t better known, as it is a real gem, fully the equal of its more renowned brethren, and Korol gave it an assured, stylish performance. The motet Exsultate, jubilate, K. 165/158a, with its familiar “Alleluia”, dates from a few years before, when the Mozart family was sojourning in Italy; Mozart wrote it for the castrato Rauzzini. Soprano Sherezade Panthaki’s voice is not what we usually hear in this piece, and took some getting used to. Her coloratura was not pristine, and she sang with a sort of perky personality that I found a tad jarring in this sacred work. The piece covers a wide vocal range, and she certainly has the notes, but something seemed off. This is a minority report, however; the audience loved her performance and gave her a standing ovation. I would have directed the acclaim toward the ensemble, which provided exemplary support. After intermission, the concert aria Voi avete un cor fedele K. 217, from the same fertile period as the violin concerto, found her in more congenial territory. Her large, warm, beautiful voice soared over the vocal lines, and the coloratura, which didn’t zig and zag as much as in the motet, was nicely executed. Her expressivity found its outlet in this aria, designed to be inserted into an opera by Galuppi, and was absolutely delightful. 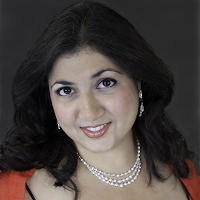 Panthaki’s website indicates she is a Baroque specialist; however, I would love to hear her as the Countess in The Marriage of Figaro. And by the time he got around to the Symphony No. 29 K. 201/186a during that same period, Mozart was in complete command of his gifts, and his genius was in full bloom. This symphony is arguably the earliest to display the glory of the mature Mozart, in his eloquent handling of the inner voices, the balanced proportions, and the individual character of the themes; the uniquely charming Andante is a highlight. The performance was a masterclass in how to perform the music of this period. Haselböck is renowned in his native Vienna as a Mozart specialist, and he showed that here, with an unerring sense of pace and a deft handling of every phrase. And although the group, which has performed in Southern California for 26 years but only recently became headquartered in Long Beach, calls itself Musica Angelica Baroque Orchestra, this concert showed that it and the music of the early Classical period, Mozart in particular, were made for each other. Resound Mozart, Musica Angelica Baroque Orchestra, Beverly O'Neill Theater, Long Beach Performing Arts Center, Saturday, February 9, 7 p.m. Images: Mozart: Getty Images; London: Getty Images; The Mozart family: Getty Images; Rauzzini: Getty Images; Ilia Korol: Lviv National Philharmonic; Sherezade Panthaki: artist website; Martin Haselböck: Meinrad Hofer. 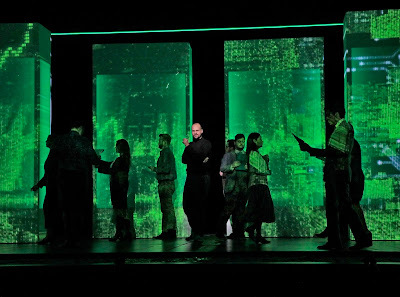 On February 23, Seattle Opera will present the west coast premiere of The (R)evolution of Steve Jobs, with music by Bay Area composer Mason Bates, libretto by Mark Campbell, directed by Kevin Newbury, with sets by Vita Tzykun. 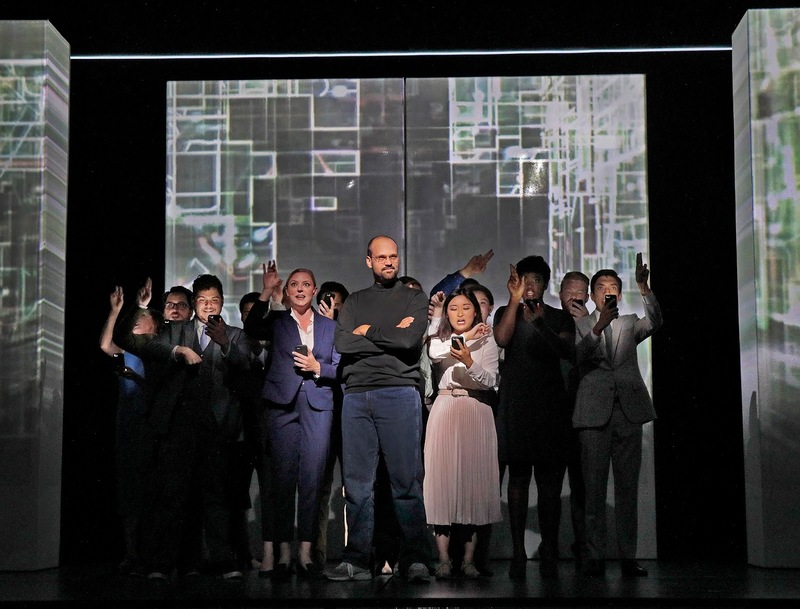 Originally premiered at Santa Fe Opera in July 2017, the work was co-commissioned with Seattle Opera and San Francisco Opera with support from Cal Performances, and co-produced with Seattle Opera, San Francisco Opera and Indiana University’s Jacobs School of Music. 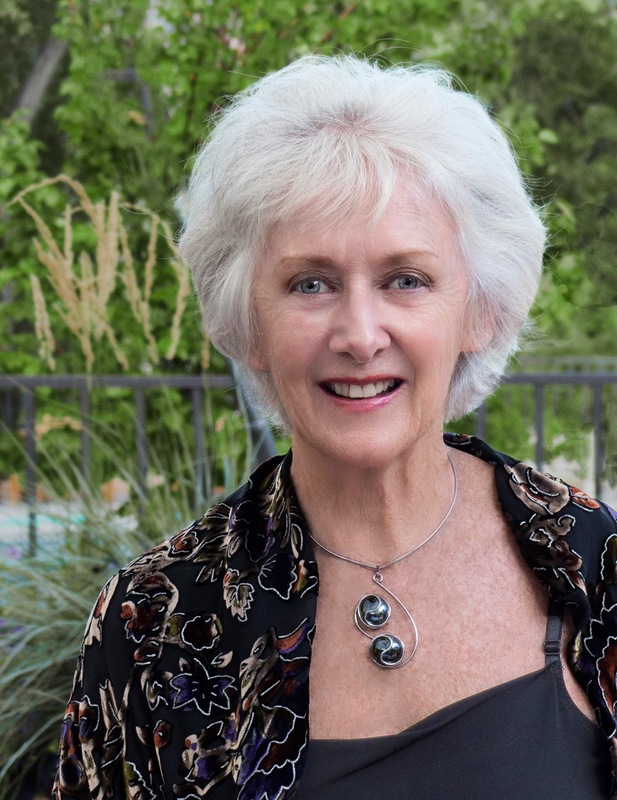 The world premiere in Santa Fe was an undeniable triumph, and the recording has 4 Grammy nominations. The story scrutinizes the life of the iconic tech giant, portraying key episodes in his extraordinarily complex journey. Combining melodic and traditional music with elements of electronic music, Bates has created a score that is both rich and introspective. 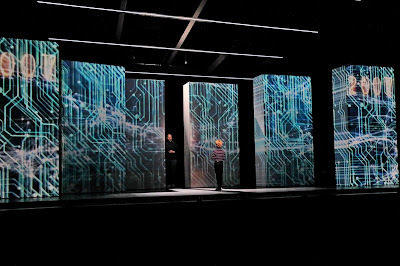 Campbell’s libretto places Jobs’ life under a microscope without sacrificing the tech giant’s deep humanity. Erica Miner: Mark, we’re so excited to see the opera here in Seattle. Having seen it in Santa Fe, I can’t wait to see it again. My husband is an I.T. guy and he’s totally psyched, too. EM: Definitely! What is the librettist’s role in creating a new opera in the 21st century? MC: The story comes first. The composer, or the commissioning organization or company, comes to us with an idea. But everything really starts with the librettist. We come up with the story, establish the structure of the opera. Also the placement of arias, ensembles, choruses—all the things we enjoy in opera. In the case of Steve Jobs, I came up with an outline and an idea of disturbing the chronological narrative so that it’s more of a circular story, based on the memory of this man rather than strict chronological, “and now this happened, and then this.” I wanted to go into his memory of his life, spurred by an acknowledgment of his own mortality. EM: What was the most difficult aspect of writing this libretto? MC: The writing was not as difficult as my worries that we would not be able to shake people’s perception of this man, because he’s so with us, still, and not just in our “one devices.” We all have a version of Steve Jobs that we think we know. It was really hard for me. Once I identified the events of his life that I thought were formative to his work and to who he was as a human being, then I had to imagine it almost as fiction. Put aside my own perceptions of this guy, try to shake off everyone else’s perceptions and create a sympathetic portrayal. I was not interested in creating a piece that vilified him for 2 hours (it ended up as 1½ hours), because what audience wants to sit through that. I wanted to figure out what was good about him, what he did and how he changed our lives in a positive way. But also not shirk, hide from some of his more challenging character traits. They’re all there in the opera. A lot of people think I created too sympathetic a portrait of Steve Jobs. That might be true, but it’s a story Mason and I wanted to tell. EM: I didn’t feel it was too sympathetic at all. You struck a perfect balance between his yin and yang, his good side and not so good side. MC: Good. [Laughs] I think he really evolved as a man, and that (his wife) Laurene had a good influence on him. When he started understanding that he had a limited time on this planet, he worked very hard at being a human being. Understanding that human beings have families, and abilities and relationships, that you have to treat people a certain way. He learned he couldn’t treat people the way he did when he was a 20-year-old. I think he evolved as a person. EM: There’s nothing like facing mortality to make us think in terms of reality. EM: How did you first meet and come to know Mason Bates? MC: I heard of Mason’s work for probably 5 or 6 years before I met him. I’d listened to his piece Mother Ship because I thought it was really cool that a composer would want to introduce electronic music into the classical orchestra pit. I also was fascinated that he was a DJ. He called me and said he was interested in writing an opera. 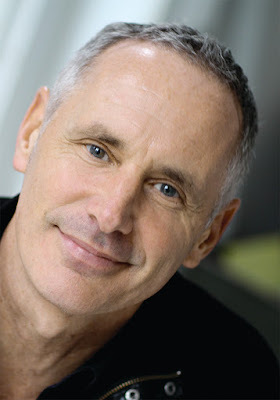 He’d heard from a mutual colleague, Mark Adamo, that I’d been writing a lot of librettos and could we talk about writing an opera together. I said absolutely. Then he mentioned the subject matter and I went, “Oh, God, no, absolutely not Steve Jobs. That’s going to be so hard.” But bless him, it was his idea, the perfect pairing of composer with subject. I can’t imagine another composer writing an opera about Steve Jobs. EM: For so many reasons. Mason is quite a fascinating character himself. I’ve interviewed him about Mercury Soul. Were his perceptions of Steve Jobs different from yours? MC: This is a really great question, Erica. When we were working on this together we had different ideas about Steve Jobs. Mine tended to be darker, more cynical. Mason’s were softer and more sentimental and he’d encourage me to be much gentler with Steve Jobs. I tended to add some very sharp, smart, often funny lines. There were times Mason would delete them and say, “I’m sorry, I just don’t want us to go there with this story.” We had a lot of back and forth about how we treated this subject. Mason encouraged me to go into a kinder view than I would have. EM: It reminds me a bit of Sondheim and Bernstein working on West Side Story. Fighting over every word and loving every minute. EM: How has the opera evolved and changed since its world premiere at Santa Fe Opera in 2017? How will this production differ? MC: Mason and I have done a major rewrite, which Seattle Opera is the first company to see. I watched the performances in Santa Fe a number of times and took notes. I started to think of ways we could improve it. Then I went out to watch several rehearsals and a performance of the production at Indiana University’s Jacobs School of Music and came back to Mason with changes I wanted to make. The most significant, that we made Laurene a much deeper character. In the Santa Fe production we were moving so quick we didn’t have enough time to examine her and see her as an independent spirit, someone apart from, not fulfilled by, being in a relationship with Steve Jobs. She was her own person. I made major changes in one scene there, and a number of smaller but significant changes throughout. 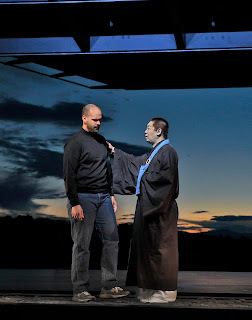 In the beginning, for example, in Santa Fe, Steve Jobs says to Kobun Chino Otogawa, “What are you doing here?” Kobun says, “I’m your spiritual adviser, I’m always around.” We don’t know that Kobun has actually died until the end of the opera. I decided it was very important for the audience to know he died. Now Steve says, “What are you doing here, you died 5 years ago.” Then Kobun says, “I’m your spiritual adviser, I’m always around. Lucky you.” A small detail but it really helps with the clarity of the story. EM: I love that idea. MC: That’s the benefit of being able to watch your work, but also the curse because when I watch something I go, “I hate what I wrote. I know it can be better.” Fortunately we had the opportunity to do that. So Seattle is seeing the same production but a better opera. EM: Now it’s even more brilliant. 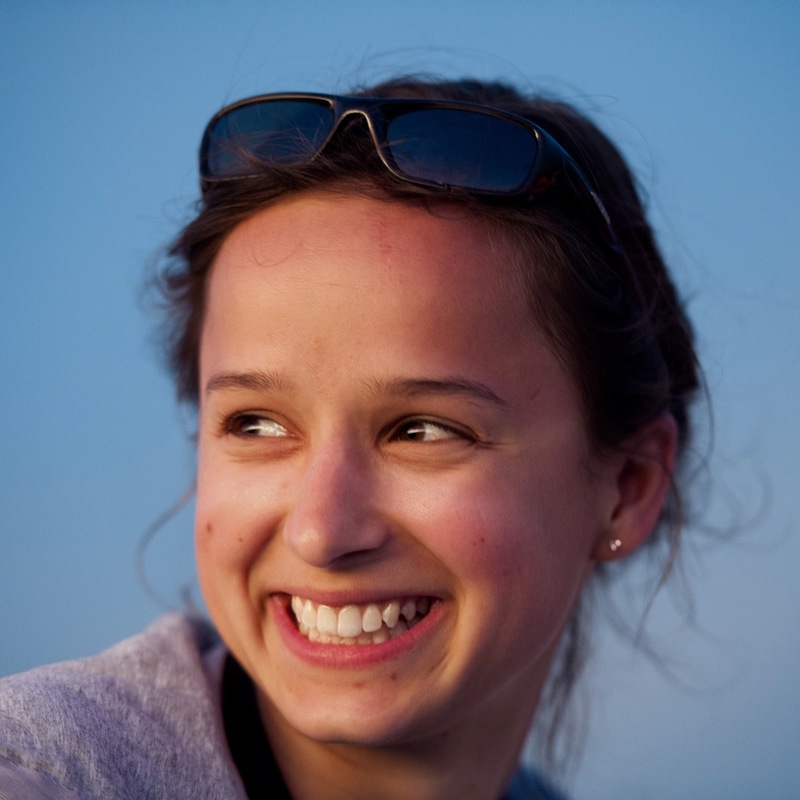 EM: What is your own personal take on how Steve Jobs changed the world? MC: That’s a great question. I don’t know if I can give a positive answer. I’m not completely convinced he made the world better. Steve Jobs changed the world by increasing communication between people. He made the world smaller. He made us closer together. He allowed us to communicate more. I don’t accept the idea that he also made us dependent on our devices. I think we made ourselves dependent on our devices. He just offered these brilliant devices. Too many people blame him for their addiction to their phone or computer. I don’t think that’s fair. He democratized the computer. He democratized technology. He also humanized technology, made it easier to use. But it is not his fault that people have become so dependent on these devices. EM: That’s very fair and balanced. Kudos to you for being able to distill it into that. EM: You mentioned the form of the story was circular, not linear. Can you go into more detail about recreating Jobs’ story and vision and in what form? MC: When I was doing my research, and I did a lot of it, and started studying—very superficially but with enough information—about Buddhism and the principles of Japanese aesthetics, I discovered this (sacred) symbol Buddhist monks draw, called an Enso—the “o” has a diacritical mark above it—the idea that a circle is never perfect, that’s the beauty of it. That was my way in, to thinking of this story in a circular fashion. Steve Jobs’ life was not perfect. He made many mistakes. So I started imagining the narrative in a circular motion. It starts one day in 2007 when he does a product launch and starts to acknowledge his own mortality. That is what engenders his going on this journey. There’s also a meditative walk. He walked a lot, often barefoot, which is something I share with him. I love going for long walks. There’s a meditative circle that Buddhists practice often, a circular walk. That started me on this journey of him going for a long walk in 2007. As he does it, events in his life come back to him. That’s where he encounters Otogawa, who helps him remember the difficult times, the beautiful times, the times he was impossible, the times he became a better human being. It’s a circular pattern that starts in 2007. We go back to many of these important events in his life—often humorous—then it ends up back the evening of that day in 2007 in the home, between Laurene Powell Jobs and Steve. She’s angry with him. He just went for a long walk and he’s unhealthy. That’s when she forces him to accept that he has to seek treatment for his cancer. He promises to do that. I’m not going to go into the last fourth of the opera because what happens there is a surprise. He then remembers the best day of his life, the day he married Laurene. From there we go into the ending. We start in the garage when Steve is 10 years old and his father makes a workbench for him. We end up there at the very end. EM: Also circular, ending where you started. MC: One thing I’m very proud of in starting with the workbench is it tells parents that when you have a kid, your job is to identify what is beautiful and possibly brilliant in them, whatever they seem to like, and encourage it as much as possible. Who knows if there’s another Steve Jobs out there who will change our lives. EM: And maybe a female one this time. 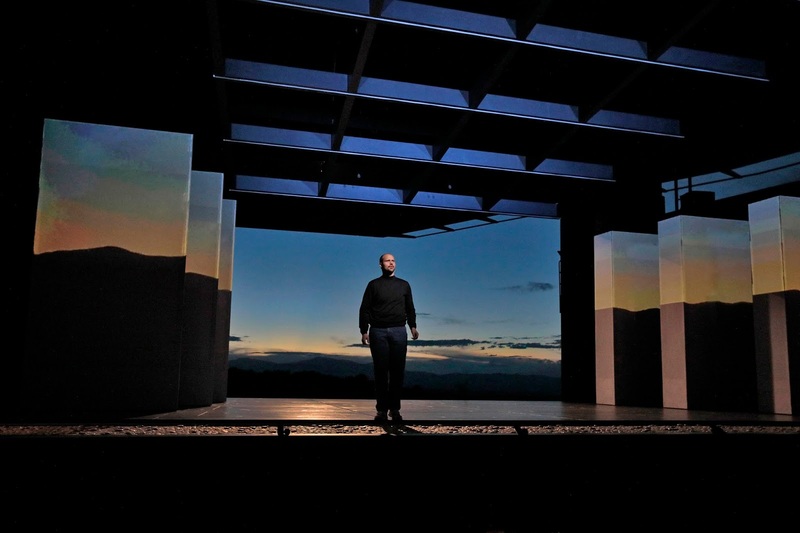 EM: Jobs has been called “unknowable.” Does the audience come to know him from watching this opera? If so, how? MC: The audience comes to know a version of him that Mason Bates and Mark Campbell wrote. My job is not to create the most comprehensive portrait of Steve Jobs. I could never do that in opera. I think it is one that delivers an emotional punch, and also a damn good entertainment. I’m not afraid of saying that [Laughs]. Does anyone ever know someone? I’m sure Walter Isaacson would say, “ Oh, he’s very knowable. That’s why I wrote this big book about him.” You could apply that to the book and say, “You just proved he’s unknowable.” I think we do a good job of giving a pretty full portrait of the way we see this man. EM: What is the most important concept that Jobs learns through his journey? 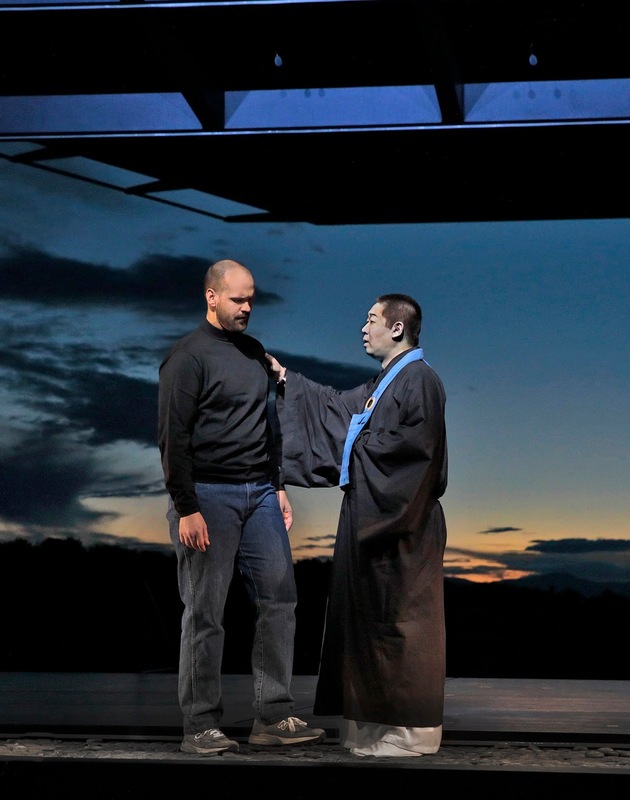 MC: His journey in this opera is learning that, unlike technology, humans make mistakes. That’s the beauty of being human. That’s why the drawing of the Enso is such a beautiful symbol for this opera. It could never be perfect. In technology we strive to make our devices as perfect as possible. Steve’s journey is finally learning that he was a human being that had faults, made mistakes. Part of understanding that is acknowledging you’ve made mistakes, that you can move forward from and learn from them. He was able to do that at the end of his life, especially with Laurene’s help, and his family. He had somewhat of a transcendence emotionally in his life. EM: What is at the core of the story, the central message? 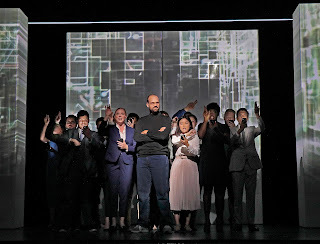 MC: At the end of the opera where Steve has died, Laurene is thinking about him and says, “Go and buy these devices but don’t spend your life on them.” She talks about version 2.0 of Steve, where he came to realize there’s more to life than technology. To appreciate the world. There are human beings around that you should be looking at. There are skies that might snow any second. We’ve gone so far with technology. I live in New York. Everyone I see on the street is staring at this rectangle in their hands. They’re not even noticing a beautiful sunset, or a beautiful person walking down the street, or a puppy right in front of them. We do in a sense warn our audience, “Let’s be careful with these things.” Steve Jobs in the latter part of his life learned that. He forbade his children playing computer games. He knew there was a certain amount of addiction to these things. The opera touches on that. 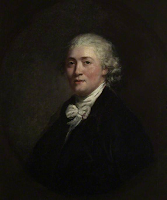 Also the irony of this man who wanted to create these perfect devices, who was a bit of a mess himself. EM: What would you like the audience to take away from this operatic experience? MC: It’s an entertainment first. I want the audience to have a good time, enjoy what they see, be wowed by the beautiful production and our tremendous cast. I don’t want to hammer that message about technology over everyone’s head. I want them to walk away not feeling this is a message-heavy opera. 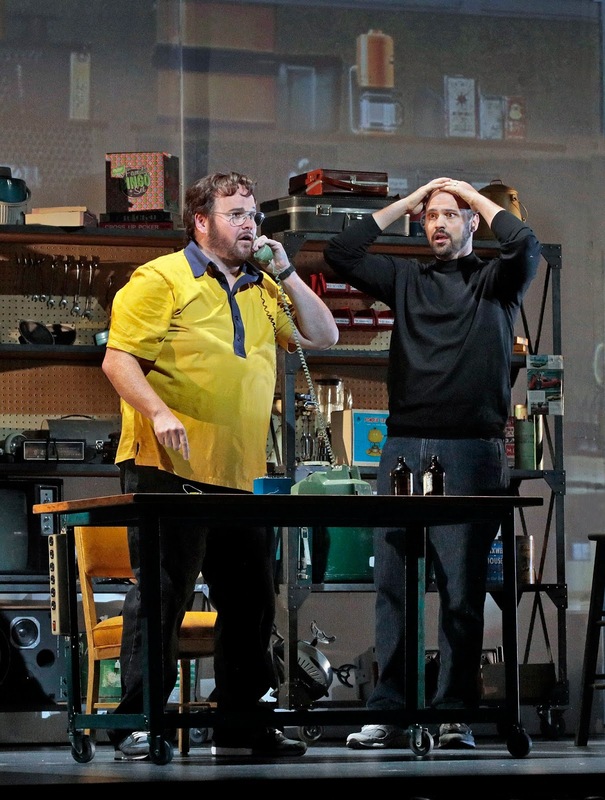 There’s room for contemporary opera to be entertaining. Not every opera has to be heavy with its message. EM: That’s a wonderful distinction. 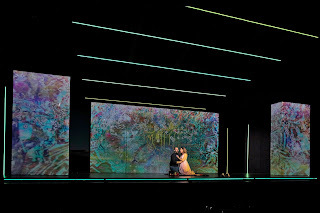 Opera is an entertainment that has a message but is not dependent on the message. MC: My responsibility is to my audience first. I think it’s incredible that anyone would even show up for a new opera. I want to reward them with a good opera that’s entertaining, that makes them cry a little bit, laugh a lot, understand something. I’m not out there to change the world. I’m out there to create good stories with great music. And Mason has written some great music. EM: That’s what Mozart and Da Ponte wanted to do, too. Certain things never grow old when it comes to the stage. MC: [Laughs] One thing that never grows old is that opera uses a beautiful abstract form to get to the heart of a character and, through that, of the audience. That’s something I never want to lose. So much contemporary opera forgets that. It should be about a character we care about, that we want to follow. Therefore I wanted to create a sympathetic portrait. I wanted the audience to follow this man. EM: The characters matter most. That’s what you take away from a stage presentation. MC: One critic referred to the opera as “user friendly” somewhat in a derogatory sense. I thought, “What’s wrong with an opera being appealing?” This opera is so appealing to its audience. They really love it. It brings them back to the opera house. That makes me very happy. EM: And you and Mason are helping that along. Toi, toi, for the opening!